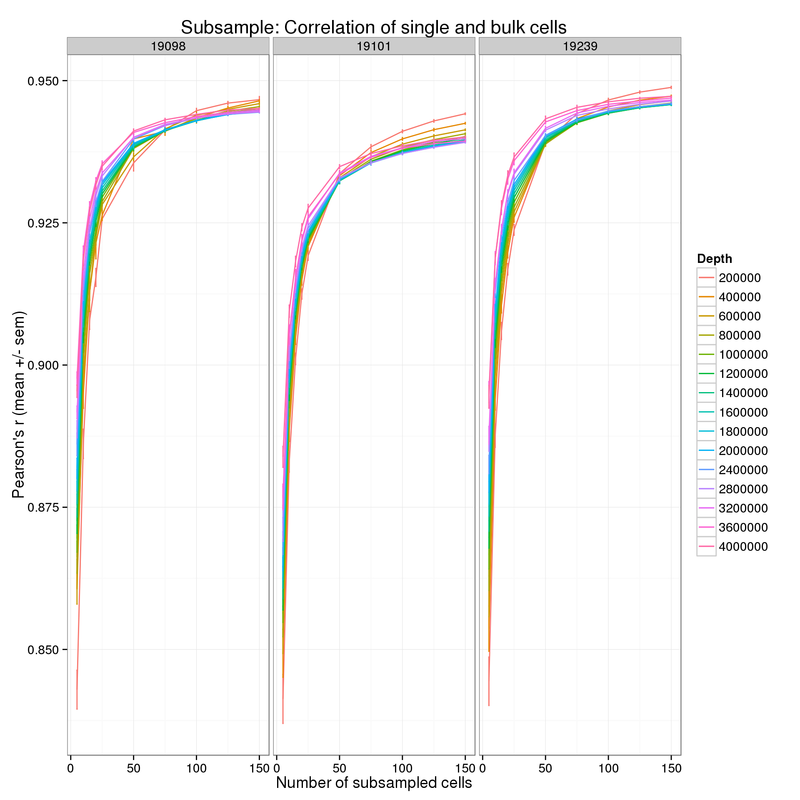 The mean counts per million in a subsampled set of single cells (both sequencing depth and number of cells is varied) is compared to the mean counts per million of the bulk cells (mean across the three batches). The mean counts are log2 transformed with an added pseudocount of 1. 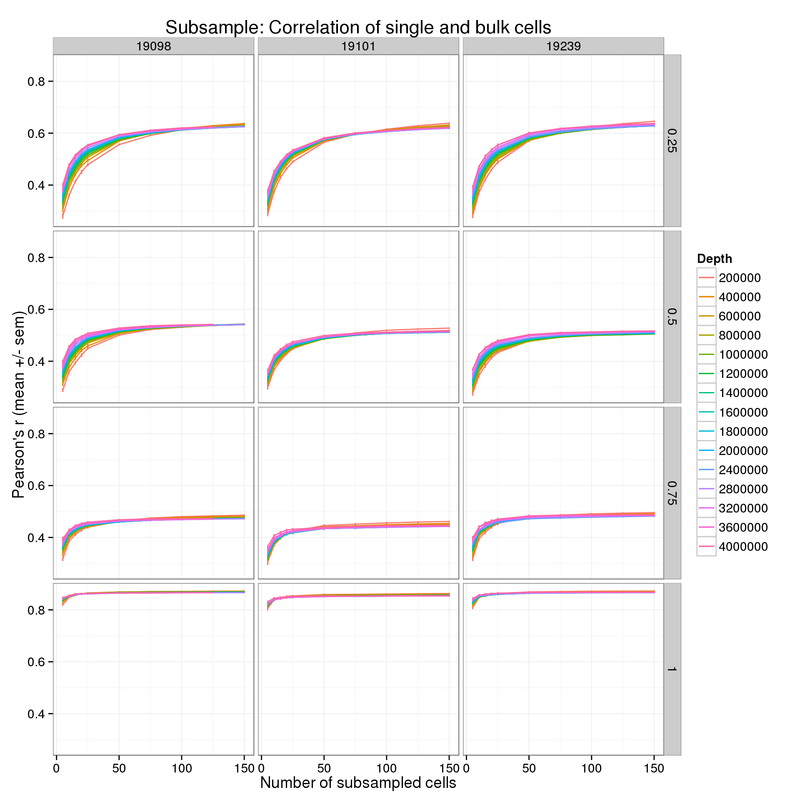 Run 10 iterations for each individual for each sequencing depth for each subsample of cells. The analysis is performed by correlate-single-to-bulk.R. CMD="correlate-single-to-bulk.R $CELLS $SEED molecule-counts-$NUM.txt $ssc/data/reads.txt --individual=$IND --good_cells=/mnt/lustre/home/jdblischak/singleCellSeq/data/quality-single-cells.txt"
CMD="correlate-single-to-bulk.R $CELLS $SEED molecule-counts-$NUM.txt $ssc/data/reads.txt --individual=$IND --good_cells=/mnt/lustre/home/jdblischak/singleCellSeq/data/quality-single-cells.txt -q .25 -q .5 -q .75"
Focus on the lower end of the distribution of the number of subsampled cells. Pollen et al. 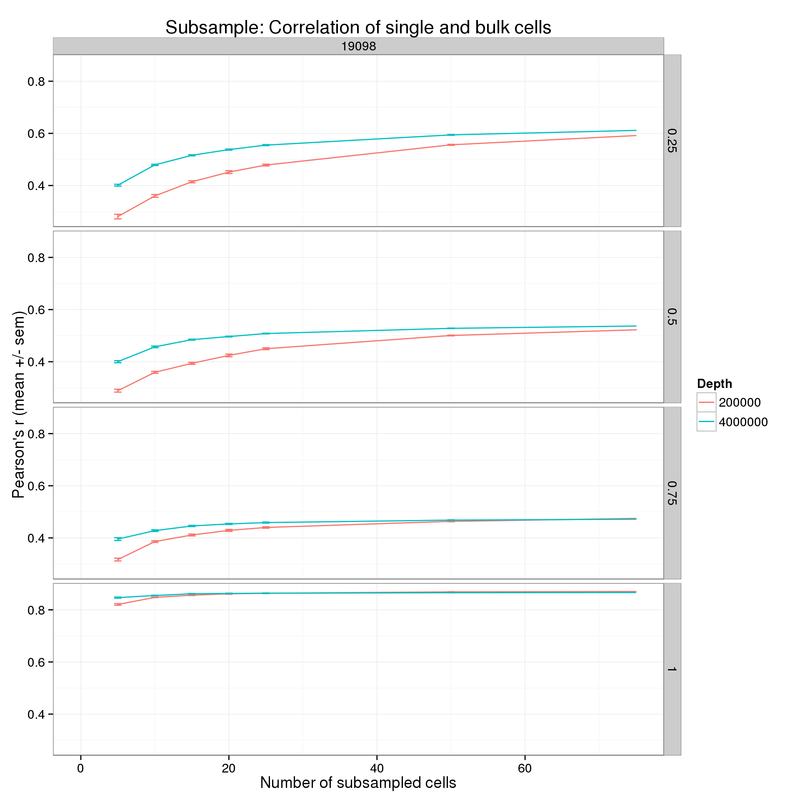 2014 observed that the correlation between the average expression in a group of single cells and the expression in a bulk sample of 100 cells quickly saturates at about 10 single cells (Figure 2ab). Each point is the mean of 10 subsamples. The high coverage samples were sequenced at a depth of ~8.9 × 106 reads per cell, and the low coverage at ~2.7 × 105 reads per cell. The data comes from 46 K562 cells. In the analysis above, all genes were used. 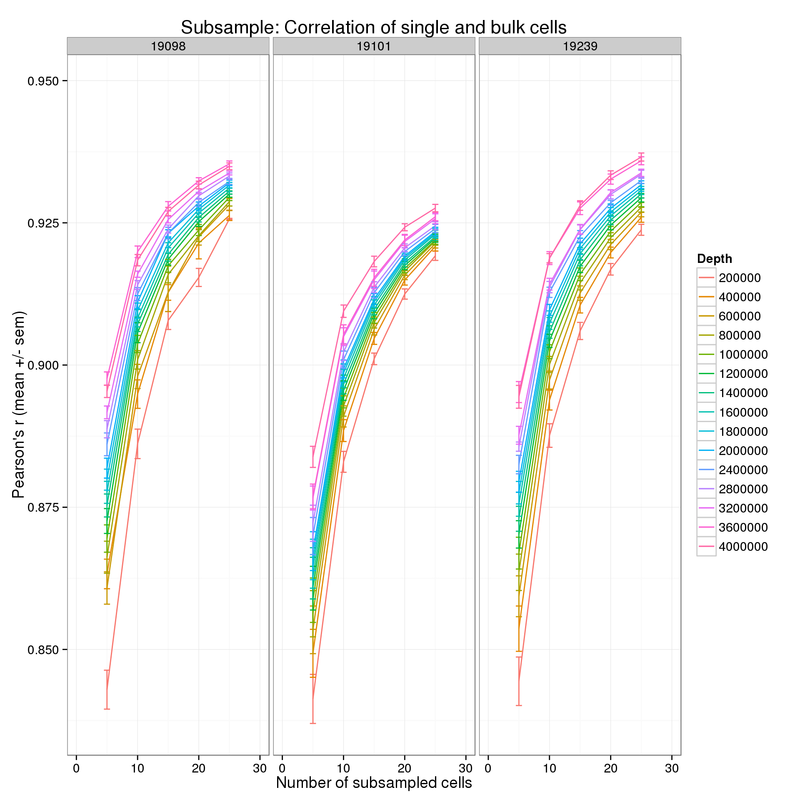 By default, the expression level in the bulk cells is used to remove the bottom 25% of genes from the analysis. This basically removes genes that are clearly unexpressed. Starting from this list of “expressed” genes, I split them into their expression quartiles. Thus we can see how the correlation is affected by the expression level. Focus on one cell line, two sequencing depths, and the lower end of the number cells.